We have something like 115 days before we are going to know just who will be playing for the Durham Bulls this year. That’s a bunch of months. And yet we can’t stop thinking about this big trade the Rays made and how much better the Bulls could be looking at the beginning of the season. 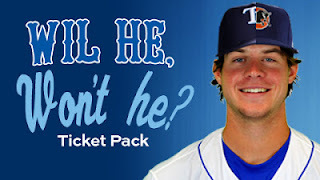 And not just the the trade that might bring Wil Myers and a couple of pitchers to the Bulls. Rich Thompson should be coming back. And the Rays just traded for a very interesting guy named Vince Belnome out of the Padres system. Some links to keep us thinking. As they should, the Bulls front office has jumped on the possibilities of Wil Myers being here with an interesting ticket offer. Worth buying into, I’d think. Also some clever photoshopping that I stole. Over at Grantland, Rany Jazyerli thinks that the Royals messed up. Joe Maddon had a few comments on the big trade. For a bit more stuff on the players involved check out this link. But for some real depth you should at the commentary over on DRaysBay. The trade opens the door for Chris Archer to make the Rays starting rotation. I was startled to see the N&O recognize that possibility and run down an interview. Here’s hoping he gets his chance. For what it’s worth, I think he is better prepared that Matt Moore was at this time last year. Over at Fangraphs Mike Newman has some worrisome comments on Tim Beckham. I can’t disagree with his observations. The stat lines from the Arizona Fall League don’t provide any insight into his progress as a second baseman. At Rays Index, Cork Gaines has updated his 40-man roster projection, which led me to chase down young Alexander Torres’ numbers for winter ball. With 10 starts, he’s getting a lot of time on the mound (47 innings). Too much? "@joro24: Congrats to @CraigAlbernaz for re-signing with the Rays today!" Thanks for everything bud. You're the best." Yahoo! Good news for the Bulls, Rays, and Biscuits.